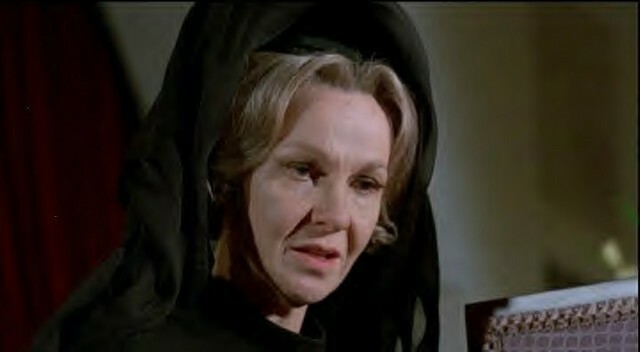 Geraldine Page was a terrific actress. But she could also be quite scary. Particularly as an older woman. The Oscar nominated star of Hondo, Sweet Bird of Youth and Interiors, the veritable fixture of New York stage and actress with a capital A, the quirky dramatics of Ms. Page usually translated to screen with a compelling, but sometimes freaky combination of forceful integrity and downright perversion. The crazy fixed eyes, the airs and, in the case of What Ever Happened to Aunt Alice?, the lopsided wigs. Produced by Robert Aldrich, who'd already created one of the greatest hags gone wild masterworks of all time, Whatever Happened to Baby Jane, the film's title, obviously cribs liberally from Baby Jane. But other than the dueling elder-leads (the fantastic Ruth Gordon co-stars) hashing out their problems (and they certainly have a few), there is little else resembling the Bette Davis Joan Crawford classic save for some screaming and brittle bones. Filmed with flavorless, TV style strokes by Lee H. Katzin, Aunt Alice is much too plodding and pedestrian for its charismatic leads. It's supposed to be scary but instead, feels sad. You'll stare at the lonely desert backdrop, scope out the late '60s furniture and clothes and feel badly for these old broads spending their twilight years in such creepy tedium. Page plays Claire Marrable, a fancy woman who's recently lost her husband only to learn he left her with nothing but debts. She moves to Arizona near her nephew George (Peter Brandon) and spends time in a modest house in the middle of nowhere where, by film start, she begins losing her grip on sanity. Looking at the flat landscape of her life, who can blame her. But her attempts to solve her financial struggles are a bit, uh, extreme. She loves nothing more than to discuss money and the stock market and imparts her thoughts to her housekeepers whom she tricks into placing their life savings in the market. When they begin to reap some change, she nabs their dough, kills them (with a shovel!) and buries their bodies in her yard. There is something incredibly unseemly about watching Page maniacally smack a feeble old ladies head with a shovel and the film knows it, though it never makes you fearful, just saddened--saddened by her character's desperation and the film role itself. Bette Davis got horrifying makeup, baby doll dresses, black and white cinematography, scene chewing monologues and dead birds, Page gets a shovel. But she does get Ruth Gordon, who comes on after the last housekeeper died. Gordon is Alice, a former nurse who soon understands how IN-sane Claire is but continues work. Why? 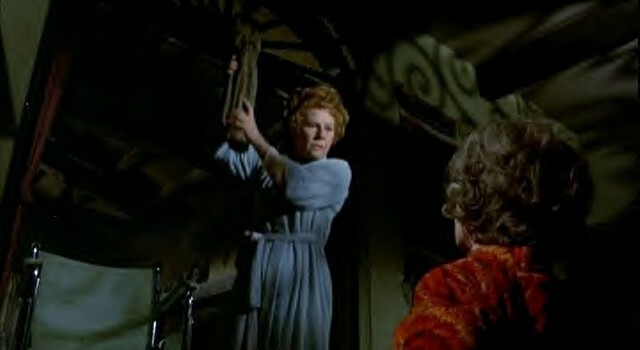 Well, she suspects something of this woman who screams at a stray dog (she even attempts to kill him, with a shovel, in one scene--not so easy) and gets too easily snippy with her saggy young neighbor Harriet (Rosemary Forsyth). The neighbor furthers a boring subplot involving a mechanic named Mike(Robert Fuller), who, as we'll learn, knows Alice and is in cahoots to figure out just what happened to (not Alice) but Edna, the last housekeeper of Claire. After her unforgettable work in Harold and Maude, Rosemary's Baby and Where's Poppa?, films where Gordon's slap-dash timing and unique speaking style were utilized brilliantly, it's a downer watching her so understated and soft spoken. This is definitely Paige's show and the actress plays the role realistically, which ruins the fireworks. Though it's admirable to see her create a character out of, really, nothing other than stock talk and murderous greed, she needed to lay on the camp. Had the director been more forceful, he would have ditched the staid style and ladled on more screaming, more killing, more liquor bottles flying and more decapitated wigs. MGM presents Whatever Happened to Aunt Alice? in Widescreen Anamorphic (1.85:1). The transfer is splendid with a crisp image and bright colors that, more than likely, have looked faded in non DVD versions. One flaw is the some overly dark moments, but they are minor and contribute and extra fear factor that probably wasn't there to begin with. The audio comes in Dolby 2.0 Mono. The sound is clear. The only extra is the film's original theatrical trailer which, like the film, fails to thrill. Though there's some nice acting here, your scary old lady jones won't be satisfied with Whatever Happened to Aunt Alice? Stick to Baby Jane, Hush, Hush Sweet Charlotte, Dead Ringer and even What's the Matter with Helen?. At least with Helen you've got the great, shrieking Shelly Winters.